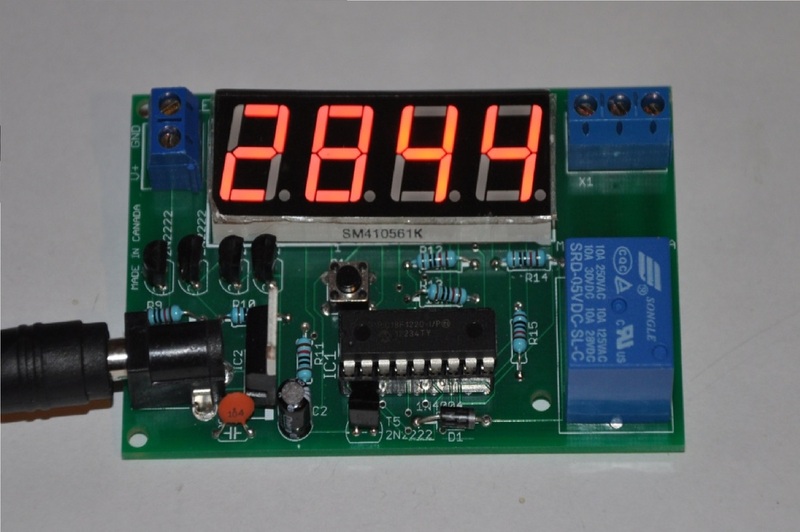 DIY multiplexed countdown timer kit with relay control & other neat features !!! This listing is for an awesome little countdown timer DIY electronics kit for paintball game enhancement that can control AC or DC devices via an on board relay once assembled. You build this yourself by following the step-by-step assembly instructions in the video below. This device was designed initially for paintball/airsoft applications, but it can be used for many other applications. One of the neatest things about this board is that the user can initiate a sequence where the countdown time is multiplied by 20x, which means that the countdown timer counts down 20x as fast. Just like in the movies! I'll talk about that more in a second. There is only one button that is used for programming. It is extremely easy to use! I'll discuss the operation below, the but above video acts to serve as the main manual for this product. Be sure to watch it! We also sell these in fully assembled form for a few dollars more. We will be selling many variants of this product. This specific listing is for a countdown timer DIY kit. No AC adapter is included. We have another listing that does include an AC adapter for $6 more. NO AC ADAPTER INCLUDED IN THIS LISTING. WE HAVE ANOTHER LISTING THAT INCLUDES A COMPATIBLE AC ADAPTER FOR AN ADDITIONAL $6.